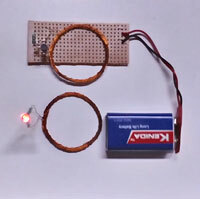 You can light an LED without a battery! It is funny to see that, the LED is glowing without power from a battery. The trick is Wireless electricity that is lighting the LED through the mechanism of Induction. Many projects are available in You tube and selected one simple project for you. The step wise procedure is explained here. You can learn some theory along with this. Make it and enjoy.